Reading and share top 161 famous quotes and sayings about Spoken Word by famous authors and people. Browse top 161 famous quotes and sayings about Spoken Word by most favorite authors. 1. "They say that secrets live at the bottom of a wine bottle. Mama had made it there the night before, slow glass by slow glass, but she'd never spoken a word." 2. "...this woman, moved by some private sorrow as much as the words being spoken, cried almost silently, unobserved by others, apart from Mma Ramotswe, who stretched out her hand and laid it on her shoulder. Do not cry, Mma, she began to whisper, but changed her words even as she uttered them, and said quietly, Yes, you can cry, Mma. We should not tell people not to weep - we do it because of our sympathy for them - but we should really tell them that their tears are justified and entirely right." 3. "There are some words that once spoken will split the world in two. There would be the life before you breathed them and then the altered life after they'd been said. They take a long time to find, words like that. They make you hesitate. Choose with care. Hold on to them unspoken for as long as you can just so your world will stay intact." 4. "When we speak from our heart and say the words our soul has only dared to whisper, that's when miracles happen. When we communicate in a heartfelt way, it's dignified and compelling, and it usually evokes support and open-heartedness from others. Words create energy. From the spoken word to the written word, from the DNA messages encoded in cells to nerve impulses connecting our mind and body, words will influence life. Words spoken from the heart bring more inspiration , motivation and good energy into our world. … marinate your heart in your words so that what you speak from your heart will reflect the love you possess inside." 5. "I am master of my spoken words and slave to those which remain unspoken." 6. "Foreword: Life is tension or the result of tension: without tension the creative impulse cannot exist. 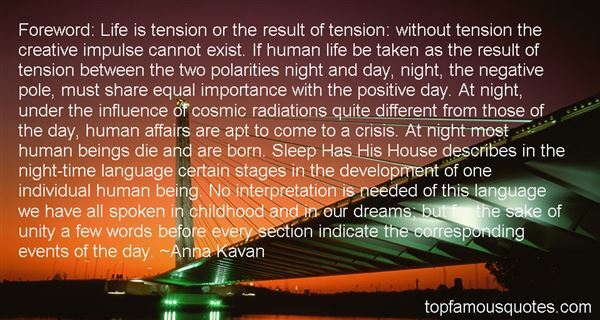 If human life be taken as the result of tension between the two polarities night and day, night, the negative pole, must share equal importance with the positive day. At night, under the influence of cosmic radiations quite different from those of the day, human affairs are apt to come to a crisis. At night most human beings die and are born. Sleep Has His House describes in the night-time language certain stages in the development of one individual human being. No interpretation is needed of this language we have all spoken in childhood and in our dreams; but for the sake of unity a few words before every section indicate the corresponding events of the day." 7. "His quick eyes seemed to miss nothing, and she couldn't hide themotion of her fingers squeezing the fabric of her skirts. His gaze rose back to her face, lingering on herlips, then meeting her eyes. Even giving away her nerves with the telltale sign of her pinched fingers, sherefused to look away. "Andreas, I think I've fallen in love.""Roman." There was a wealth of unspoken meaning in that one word, so darkly uttered. But Roman'stoo-beautiful mouth crooked, head cocked, eyes watching." 8. "Under a smoky streetlamp I stood face to face with my beloved and pricked my fingers against the diamond studs of her immaculate shirt front. Being tall, she slipped her hands naturally about my hips and pulled me close. And being bold, I put my mouth on hers and this time went inside and told her all the things I'd been longing to. Dark and sweet, the elixir of love is in her mouth. The more I drink, the more I remember all the things we've never done. I was a ghost until I touched you. Never swallowed mortal food until I tasted you, never understood the spoken word until I found your tongue. I've been a sleep-walker, sad somnambula, hands outstretched to strike the solid thing that could awaken me to life at last. I have only ever stood here under this lamp, against your body, I've missed you all my life." 9. "I probably won't play a song the same way tomorrow as I play it today. Only a pitchman says the same thing the same way twice, without varying a word. If music is a language, why don't people use it with the same subtlety, nuance, and facility as they do the spoken language? Probably because they don't verbalize with the same vocabulary and tone they once did. It has been said that a people's character is reflected in their music. Our culture is a perfect example. If people here walk around using one-syllable words with no color, no variety, no shading, how can we expect our musical language to be any different? It's like the emperor's new clothes – sure they can sit and make wild noises on their synthesizers and call it music – who questions? But ask them to pull up a chair and play ‘Gal in Calico' or Temptation,' or even a straight dramatic version of ‘The Star-Spangled Banner' and they can't do it. They're too pretentious. They can't just play songs." 10. "My silences had not protected me. Your silence will not protect you. But for every real word spoken, for every attempt I had ever made to speak those truths for which I am still seeking, I had made contact with other women while we examined the words to fit a world in which we all believed, bridging our differences." 11. "One misspoken word and the world will no longer know you. Mark Andrew Ramsay"
12. "It was like they waited to tell each other things that had never been told before. What she had to say was terrible and afraid. But what he would tell her was so true that it would make everything all right. Maybe it was a thing that could not be spoken with words or writing. Maybe he would have to let her understand this in a different way. That was the feeling she had with him." 13. "He hadn't spoken a word since they'd left the manor except to snap out directions, telling her which way to turn at a fork in the road, or ordering her to skirt a pothole. Even then she doubted if he would have minded much if she'd fallen into the pothole, except that it would have slowed them down." 14. "He bent to put his cheek against hers. His breath against her ear made her shudder with each deliberately spoken word. "I have wanted to do this," he said, "every moment of every hour of every day that I have been with you since the day I met you." 15. "It's destiny; the stars have aligned perfectly to bring us together as friends. You cannot argue with what's meant to be, once the stars have spoken, it is absolute," he uttered, all smug and knowing. Shocked that he used the word destiny, I cocked my head and shot him a look—for the first time actually seeing Parker. He was pretty…too pretty to be a guy; streaky blond hair—as if each streak had been strategically placed—dark eyes, pale skin, and a charming smile that dimpled in one cheek. "Destiny has already found me, with a clearly marked path for my future," I retorted. "Then you are doubly fortunate, to have it find you twice." Parker smiled again, his eyes eerily piercing into mine. Parker and Danielle"
16. "Elliot folded her hands in her lap as Felicia entered the building. She figured Kai would follow, but he remained still, standing over her like a guard. His shadow fell across her lap, and she traced its edges with her hands. The places he's touched her - her torso, her chest, her elbow - still tingled. His words echoed in her ears. He hadn't spoken a word to her directly since that night in the barn. She soaked up every syllable like it was rain on parched soil. "You're all right""Careful""Can you stand on your own?" 17. "My art, what do you want to say about it? Do you think you can explain the merits of a picture to those who do not see them? . . . I can find the best and clearest words to explain my meaning, and I have spoken to the most intelligent people about art, and they have not understood; but among people who understand, words are not necessary, you say humph, he, ha and everything has been said." 18. "I take it that "gentleman" is a term that only describes a person in his relation to others; but when we speak of him as "a man" , we consider him not merely with regard to his fellow men, but in relation to himself, - to life – to time – to eternity. A cast-away lonely as Robinson Crusoe- a prisoner immured in a dungeon for life – nay, even a saint in Patmos, has his endurance, his strength, his faith, best described by being spoken of as "a man". I am rather weary of this word " gentlemanly" which seems to me to be often inappropriately used, and often too with such exaggerated distortion of meaning, while the full simplicity of the noun "man", and the adjective "manly" are unacknowledged." 19. "He felt his hunger no longer as a pain but as a tide. 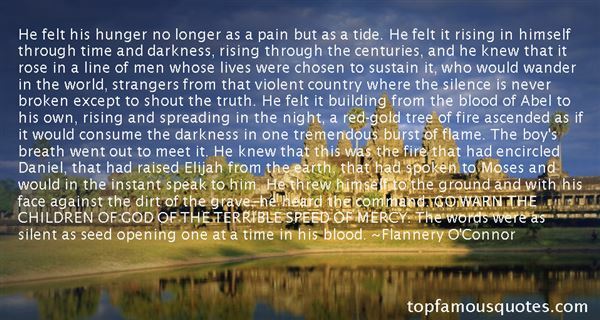 He felt it rising in himself through time and darkness, rising through the centuries, and he knew that it rose in a line of men whose lives were chosen to sustain it, who would wander in the world, strangers from that violent country where the silence is never broken except to shout the truth. He felt it building from the blood of Abel to his own, rising and spreading in the night, a red-gold tree of fire ascended as if it would consume the darkness in one tremendous burst of flame. The boy's breath went out to meet it. He knew that this was the fire that had encircled Daniel, that had raised Elijah from the earth, that had spoken to Moses and would in the instant speak to him. He threw himself to the ground and with his face against the dirt of the grave, he heard the command. GO WARN THE CHILDREN OF GOD OF THE TERRIBLE SPEED OF MERCY. The words were as silent as seed opening one at a time in his blood." 20. "Even the most outspoken of the critics must admit that long before we had print and film media to "spread the word," mankind was engaged in all forms of cruel and despicable behavior. To attribute war, killing, and violence to film, TV, and role-play games is to fly in the face of thousands of years of recorded history." 21. "The spoken word vanished with the wind. Likewise, the unrecorded life disappears as if it never existed." 22. "Where the storyteller is loyal, eternally and unswervingly loyal to the story, there, in the end, silence will speak. Where the story has been betrayed, silence is but emptiness. But we, the faithful, when we have spoken our last word, will hear the voice of silence." 23. "Writing comes into being to retain information across time and across space. Before writing, communication is evanescent and local; sounds carry a few yards and fade to oblivion. The evanescence of the spoken word went without saying. So fleeting was speech that the rare phenomenon of the echo, a sound heard once and then again, seemed a sort of magic." 24. "I remember how, as a boy, I used to collect the cork tips of my father's cigarettes and stick them in my stamp albums. I believed they contained his unspoken words, which one day would explain everything. I have not changed. Now I explore my memories, trying to discover the substructure hidden beneath my past actions, searching for the link to connect them all." 25. "...sorrow binds us - I will always cherish you - my only disillusionment is unspoken words ..."
26. "Rap and spoken word have reawakened the country to poetry in itself. Texting and Twitter encourage creative uses of casual language, in ways I have celebrated widely. But we've fallen behind on savoring the formal layer of our language." 27. "What said those two souls communicating through the language of the eyes, more perfect than that of the lips, the language given to the soul in order that sound may not mar the ecstasy of feeling? In such moments, when the thoughts of two happy beings penetrate into each other's souls through the eyes, the spoken word is halting, rude, and weak—it is as the harsh, slow roar of the thunder compared with the rapidity of the dazzling lightning flash, expressing feelings already recognized, ideas already understood, and if words are made use of it is only because the heart's desire, dominating all the being and flooding it with happiness, wills that the whole human organism with all its physical and psychical powers give expression to the song of joy that rolls through the soul. To the questioning glance of love, as it flashes out and then conceals itself, speech has no reply; the smile, the kiss, the sigh answer." 28. "Had we been wed in Scotland, we could have spoken the old vows. Do you know what words, what promises we would have spoken had we been there, not here, this morning?" His hand slid up to her cheek, cupping it as if to soften the effect of his tone, and as Elizabeth gazed at his hard, beloved face in the candlelight her shyness and fears slid away. "No," she whispered. "I would have said to you," he told her quietly and without shame, "'With my body, I thee worship. '"He spoke the words now, as a vow, and when Elizabeth realized it, the poignancy of it made her eyes sting with tears. Turning her face into his hand, she kissed his palm, covering his hand with hers, and a groan tore from his chest, his mouth descending on hers in a kiss that was both rough and tender as he parted her lips for the demanding invasion of his tongue." 29. "My mum is Brazilian and very proud. I'd love to do a Brazilian film. I've been brought up in the Brazilian culture. My mum brought me up on my own, I cook Brazilian food, I've never spoken a word of English to my mother." 30. "No mother. Two small words, and yet within them lay a bottomless well of pain and loss, a ceaseless mourning for touches that were never received and words of wisdom that were never spoken. No single word was big enough to adequately describe the loss of your mother." 31. 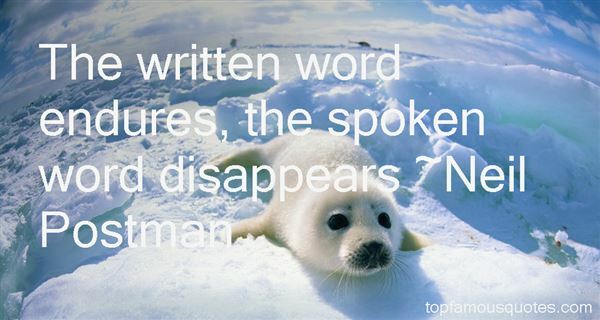 "The unspoken word never does harm." 32. "I set my face toward the sun again, and I think about my old life—the one I feel as though I've abandoned somehow. It hurts to think of it that way. And even though I know it wasn't perfect, I look back now, and all I see is perfection. Every soft whisper, every spoken word, every gentle touch—it's all perfect. Time won't let me see it otherwise. They're all just perfect memories—perfect, untouchable moments that came and went so softly that they almost feel as if they were always just a dream." 33. "We're pupils of the religions—Catholic, Protestant, Jewish . . . Well, the Christian religions. Those who directed French education down through the centuries were the Jesuits. They taught us how to make sentences translated from the Latin, well balanced, with a verb, a subject, a complement, a rhythm. In short—here a speech, there a preach, everywhere a sermon! They say of an author, "He knits a nice sentence!" Me, I say, "It's unreadable." They say, "What magnificent theatrical language!" I look, I listen. It's flat, it's nothing, it's nil. Me, I've slipped the spoken word into print. In one sole shot." 34. "When a pebble falls down a well, it is gratifying to hear the eventual plunk. If, however, the pebble only slips into darkness and vanishes without a sound, the effect is disquieting. In the case of a verbal echo, spoken word acts as the pebble and the subsequent repetition serves as "the plunk." In this way, speaking can result in a form of "seeing"..."
35. "Spoken often enough, words become [became] nonsense." 36. "It shall greatly help ye to understand the Scriptures if thou mark not only what is spoken or written, but of whom and to whom, with what words, at what time, where, to what intent, with what circumstances, considering what goeth before and what followeth after." 37. "But perhaps, after so much talk and fighting, unspoken words do create a silence in whose gentleness the survivors of good and bad can sleep easy." 38. "To me, presentations are the most powerful device. You can't really name a movement that didn't start with the spoken word." 39. "The written word endures, the spoken word disappears"
40. "Thought is an Idea in transit, which when once released, never can be lured back, nor the spoken word recalled. Nor ever can the overt act be erased." 41. "Those who are near me do not know that you are nearer to me than they areThose who speak to me do not know that my heart is full with your unspoken wordsThose who crowd in my path do not know that I am walking alone with youThose who love me do not know that their love brings you to my heart"
42. "Many wise words are spoken in jest, but they don't compare with the number of stupid words spoken in earnest." 43. "Words. I'm surrounding by thousands of words. Maybe millions...Deep within me, words pile up in huge drifts. Mountains of phrases and sentences and connected ideas. Clever expressions. Jokes. Love songs...I have never spoken one single word. I am almost eleven years old." 44. "This career essentially chased me down while I was on the spoken-word scene in New York. I kept hearing that my delivery of my poetry - which was very personal and cathartic at the time- was very moving to folks. People thought that I was an actress because of my delivery, when I was just dropping into the work and really pouring out my soul." 45. "While addressing the Saints from this pulpit in 1948, the late President J. Reuben Clark, Jr., spoke concerning having a prophet and a listening ear. He had read a pamphlet stating, "We need a prophet." In answer he said, "No, we have had modern-day prophets for more than a hundred years, and they have given us the word of the Lord." He continued, "The trouble with the world is they do not want a prophet teaching righteousness. They want a prophet that will tell them that what they are doing is right, no matter how wrong it may be." A prophet has spoken--the prophet is speaking. We do not need another prophet. What we need is a listening ear. (See Conference Report, Oct. 1948, pp. 79-80).I pray that we may not only heed the words of President Clark, but that we may listen and follow the counsel that is now given as it comes by inspiration and revelation from the Lord himself to the prophets today." 46. "India of the ages is not dead nor has she spoken her last creative word; she lives and has still something to do for herself and the human peoples." 47. "It's nothing he can see or lay hands on - sudden gases, a violence upon the air and no trace afterward... a Word, spoken with no warning into your ear, and then silence forever. Beyond its invisibility, beyond hammerfall and doomcrack, here is its real horror, mocking, promising him death with German and precise confidence, laughing down all of Tantivy's quiet decencies... no, no bullet with fins, Ace... not the Word, the one Word that rips apart the day..."
48. "It's not a natural translation, transition, to take something from stage to screen. Onstage your action is communicated through the spoken word primarily, and on screen it's communicated through pictures. So it's always been kind of unnatural to take something that lives on the stage and turn it into moving pictures." 50. "In some measure, stimuli from the outside, especially when they are printed or spoken words, evoke some part of a system of stereotypes, so that the actual sensation and the preconception occupy consciousness at the same time. The two are blended, much as if we looked at red through blue glasses and saw green." I am paving hell with energy... I am laying down good intentions which I believe durable as flint."